Escalier d’honneur | One quality, the finest. The other day, I wrote about a special exhibit at the Frick in New York. There’s another exhibit there at the moment that features a single, very special painting. 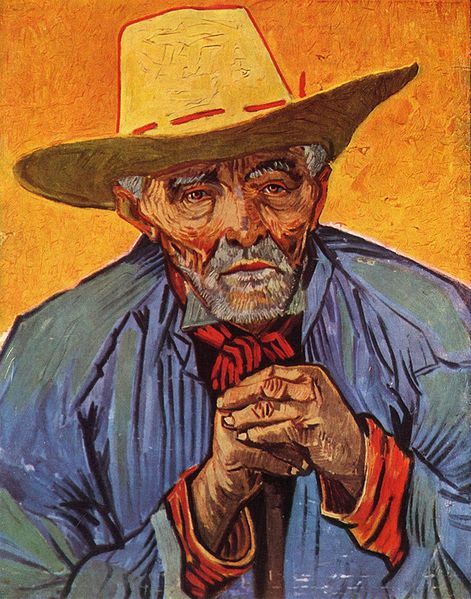 Vieux Paysan Provençal (Portrait of a Peasant) was painted by Vincent van Gogh in 1888 while he was living in Arles. The painting hasn’t left its home in the Norton Simon museum in Pasadena in 40 years. The peasant in the portrait, Patience Escalier, was a farmer and former shepherd. Van Gogh chose Escalier because he resembled the artist’s father. Van Gogh used brilliant colors – the yellow hat represents the sun, the blue background represents the sky, and his green jacket represents the life of the farmer’s crops. Even the color of the paint used to shade the contours of Escalier’s face had symbolic value. Van Gogh said it represented the color of the soil, or “the very furnace of harvest time, deep in the south.” The Dutch artist chose a vivid palette to honor the humble life of the farmer, rather than painting him in dull, muddy colors as so many of his predecessors had done. In fact, he was so interested by Escalier that he painted him twice in the same month. The other version, at left, is in private hands. The painting will be on display on January 20, 2013. Today’s expression, escalier d’honneur (es-kal-e-ay donur) literally means “staircase of honor,” but we’d say “grand staircase.” Van Gogh not only honored, but immortalized, Patience Escalier. 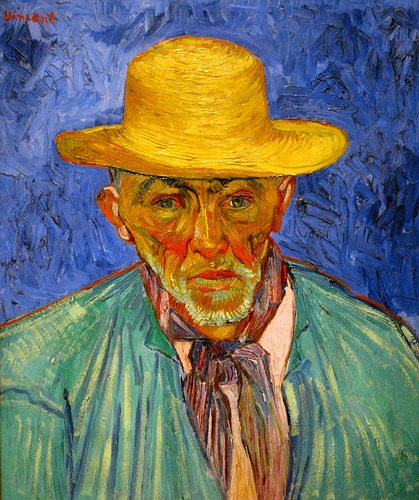 This entry was posted in Art and tagged Arles, escalier d’honneur, Frick Museum, New York, Norton Simon museum, Pasadena, Patience Escalier, Portrait of a Peasant, Van Gogh, Van Gogh’s Room at Arles, Vieux Paysan Provençal, Vincent Van Gogh. Bookmark the permalink.